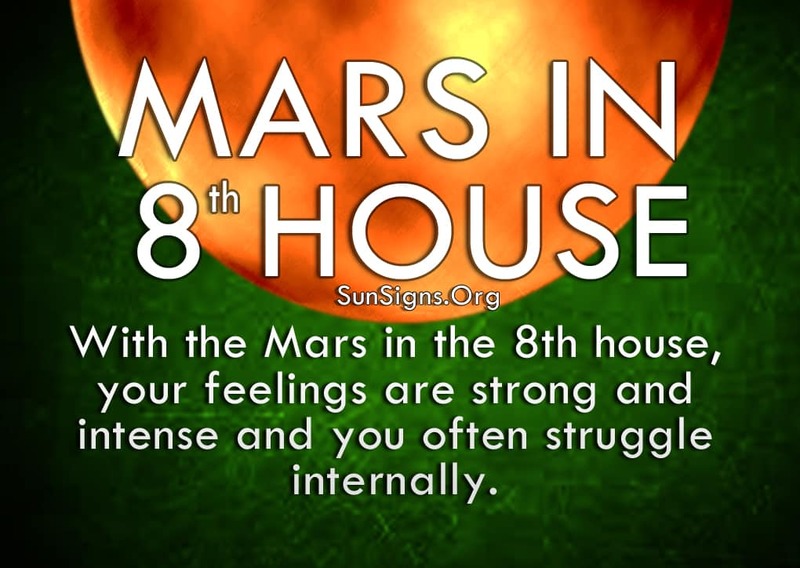 Your feelings are strong and intense with Mars in the 8th house as this is ruled by the Scorpio zodiac sign. You often struggle internally with the deep questions of life and its hidden meanings. You are constantly looking for these answers while finding little or no relief. Your instincts, however, are usually spot on toward other people. You don’t like others to see how vulnerable you are, so you tend to keep everything hidden down deep. There are many layers to your psyche and emotions. But only those closest to you will get to see even a small portion of that. The effect of Mars in eighth house in astrology is dark and mysterious. You put forth the most energy reading other people while keeping your desires under lock and key. The Mars in 8th house astrology shows that you have the ability to read other people like a book, and your instincts are unrivaled. You always know what’s going on behind the scenes. No one can hide anything from you. This is what drives you the most – learning the truth about others and about any situation. You can’t be fooled and you pride yourself on this ability. That’s why absolute loyalty is the only thing you will accept from your friends and family. Often times, you don’t give your heart to someone unless you feel they are the one. This means you may not allow yourself to experience love until you are somewhat older, but that also means it is more magical to you. And in that case, you are also more insatiable in the bedroom. This is where you let your true colors shine and you allow your partner to see into the depths of you. This offers the most spiritual feeling for Mars in the 8th house, for you can truly be yourself without fear of rejection. The Mars in 8th house meaning shows that you tend to get attached to people. Because of this you have trouble letting someone go or allowing your partner to be independent. You can become quite possessive of your loved ones, which can cause problems if they feel you are starting to smother them. This is where your intensity become a hindrance, and you have to learn to dial it back a bit. Your desire overcomes your practical nature and you have trouble seeing the big picture. You are extremely focused on the minute details of your life and the lives of those around you. Then you have difficulty allowing them to just be, without you constantly being there with them. The Mars in eighth house predictions show that you have to learn to trust your partner’s fidelity and distance yourself from them when they need space. It doesn’t mean they don’t love you, it simply means they have other interests besides you. In fact, when you feel someone has wronged you, they are placed on your grudge list. And no one can hold a grudge like you can. The slightest infraction feels like a complete betrayal to you, and nothing can be said to change your mind. Your trust is sacred and you don’t offer it lightly, although you don’t like to tell anyone that in the beginning. They have to earn your trust to learn how precious it is, and how easy it is to lose it.